Larry Elmore just found and released to the public 50 lithograph prints of his "Fool's Gold" painting which was completed for a Dragon Magazine cover back in 1988. The lithograph was a huge success and has been sold out for years. Larry apparently came across these gems while hunting for luggage! The hidden treasures we sometimes find in our own spaces are amazing! 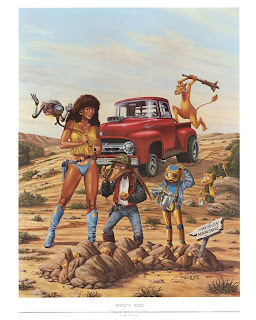 This lithograph is for the avid Snarfquest fan and will sell out fast! Snarfquest is a graphic novel that originally ran in Dragon Magazine from 1983-1989. Snarfquest: The Graphic Novel was published in 2000 as a 224 page collection. SnarfQuest currently appears in all-new full color stories as a bimonthly feature in the magazine Games Unplugged. Strange but very interesting cover. There's a lot in this painting. Actually Games Unplugged went defunct in about 2004. I don't think they ran SnarfQuest for the entire duration of their existence, although they may have. I've tracked down the first 20 or so issues.